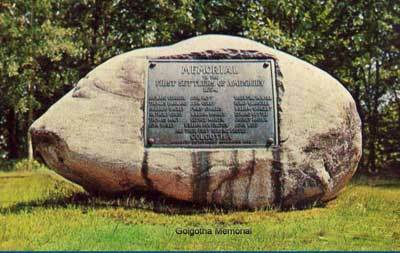 In 1640, the first Puritan settlers arrived to Amesbury; their first burying ground was on a hill overlooking the Powow River, now referred to as Golgotha. The grave stones or markers in this first burying ground have long since disappeared, along with the identity of the people buried here. In 1903, a memorial was erected by the Amesbury Improvement Association, to mark the site of Amesbury's first burying ground. They called the site Golgotha meaning, "a place of great suffering" or a burial ground. Since there is no accurate record of who was buried in this first burying ground, the plaque on the monument lists the identity of the first eighteen settlers in Amesbury. These eighteen settlers include Anthony Colby and his oldest son John Colby (1633-1673). Anthony Colby (1605-1660) and Valentine Rowell (1622-1662) were the first of the original settlers to die in Amesbury (then part of Salisbury), and are undoubtedly interred in Golgotha. The memorial plaque names several others who are buried elsewhere; such as Thomas Macy (1608-1682), the original owner of the Macy-Colby House, who had moved to the island of Nantucket in 1659 and Edward Cottle, who died on Martha's Vineyard in 1710. The Bartlett Cemetery Association maintains and preserves this historical home.